We did it, we did it, we did it!!!! I can hardly believe that after months and months of training and running and generally working our asses off we finally ran the Huff 50K!! And it went well! Really super well! We finished in 6:55:55.19 which is just under my dream goal of 7 hours. The goal that I never really thought was even possible. But we did it. I still can't really believe it even though it's been three days. Don't mistake me, it was hard. The hardest thing that I've ever done. But it was sooooo worth all the work and pain to be able to say that I am an Ultramarathoner! On the whole, the race went really well. Much better than expected. We had great weather on race day. 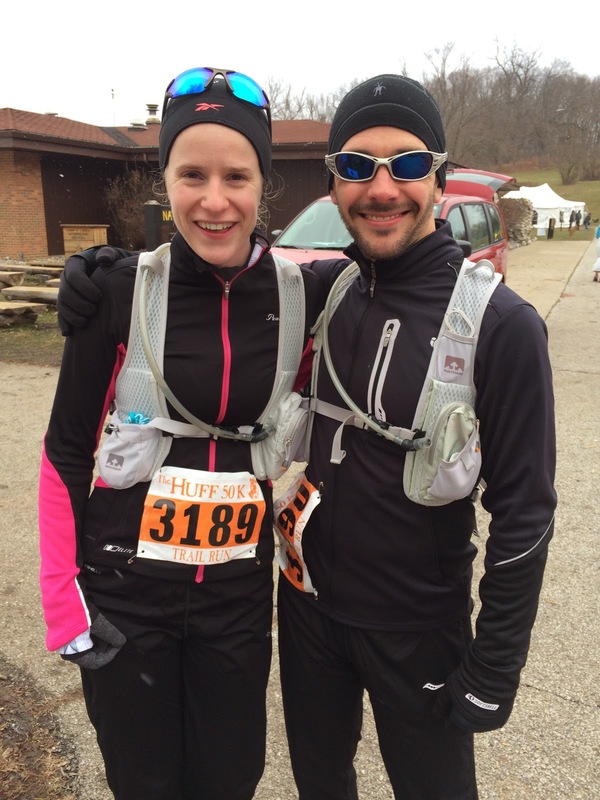 It was about 28F at the start of the race and 32F by the end and both dry and still for the whole day. A thin layer of clouds kept it from getting too hot or bright. The race started a little late and it was 8:28 when I pushed start on my phone. I started the race feeling really good so we decided to just go with the flow and see what I could do. And the first loop of 15.6 miles went fast. I felt great and had no problem maintaining a faster pace than I have in a long time. My pace fluctuated between 10-11 minute miles with my fastest mile coming in at a 9:52! We finished the first loop in about 2 hours 57 minutes with an average pace of about 10:57. It was a really fun loop! We ran with one man from about miles 5-8 who regaled us with stories of his running experiences and general chit chat. And then from miles 13-15 we ran with a 17 year old high school kid named Joel. He was pretty shy and quiet and kept pace with us well. We got separated at the end of the first loop when he ducked into the tent to grab some food. My main challenge this loop was that the mouth piece of my pack froze and I wasn't able to drink from it. I drank some from Justin's pack and got cups of water and gatorade at each of the four aid stations. The second loop started out pretty well and gradually slowed down which was about what I expected. Justin managed to get my mouth piece open at the start which was wonderful. Having more reliable access to water was really helpful. In general, the second loop was much more difficult than the first loop. Because really, the first loop felt easy and comfortable. It was only 15.6 miles. But the second loop was miles 15.6 thru 31.2. And that's a much harder set of miles. My legs were quite tired by the end, of course, but my biggest problem was that my back hurt quite badly. I'm not really sure what the cause was. I hadn't had that problem during any of the training runs so I was rather surprised to have it be such a problem. 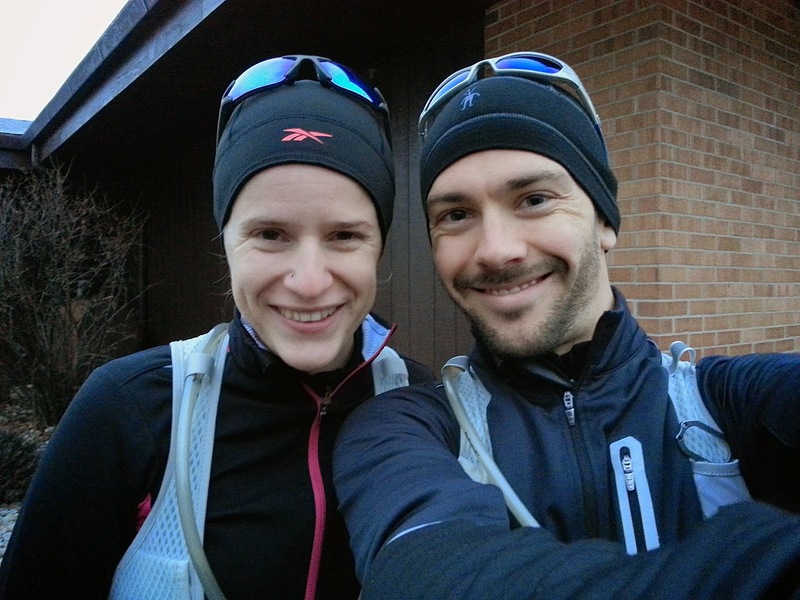 Around mile 22 I asked Justin if he could think of anything to talk about because I knew that having a conversation would help me focus on something other than my back. I'd been trying to come up with a topic for a couple of miles of that point and just wasn't able to come up with anything. Justin started talking about animals and we spent the next several miles jumping from one type of wild animals. That held me until mile 27 when my back started to get to me. My back felt completely fine when I was walking so it was hard to push through and run as much as my legs felt like they could have. Walking made my legs tighten up though and then it was harder to run. The last five miles went much like that. Walk some and then run for as long as I could stand and then drop back down to a walk. It was painful and frustrating and I just about started to cry several times. But Justin stuck with me the whole time despite me urging him to go ahead. He could have finished much faster if he had left me and picked up the pace a little. But he wouldn't go and we finished the race just like we ran it; side by side. And then after the race there was a heated tent, dry clothes, lots of warm soup and hot chocolate, and a new friend named Matt (he finished 17th!) who shared conversation, advice, and a bottle of marshmallow vodka with us. All in all, it was a pretty darn good day!